The final stage of temporary jump span installations on the Metro-North/Atlantic Street Bridge is complete. Construction will now begin on the abutment footings for the new replacement bridge. Operations continue on the drilled shafts for the new retaining wall on South State Street and on the North Assembly area near Elm Street where the bridge superstructure will be constructed. The replacement bridge is scheduled to be rolled into place in June 2019 and will be wider and longer than the current bridge. As a result, the wider bridge will accommodate a new Track #7 for dedicated local train service. In addition, Atlantic Street under the bridge will be wider to accommodate 3 southbound and 3 northbound lanes and lower to increase the vertical clearance under the bridge to 14’6” to better accommodate commercial and emergency vehicles. The existing bridge was constructed in 1896 and carried the original designation of Bridge 67A. Designed by the New York, New Haven and Hartford Railroad’s Engineering Department, the bridge used 245 tons of steel and was fabricated and erected by the Berlin Iron Bridge Company of East Berlin, CT. For most of its life, it has been known as Bridge No. 21.24 reflecting the milepost distance from the junction of the New York, New Haven and Hartford Railroad with the Harlem line of the New York Central and Hudson River Railroad at Woodlawn, in the Bronx. The current bridge represents railroad engineering from the 1800’s. 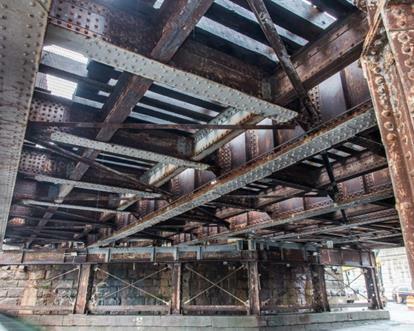 During that time, substantial plate girders were used for most of the railroad’s bridges over public streets. This bridge had to be wider on the south side to allow for the turning radius of streetcars. In addition, all six main girders are different, which was considered unusual design for that time.